Today I’m happy to have Bishoi Khella on the show. Bishoi and his partner Ibrahim started MyTruwood.com which is an affordable and stylish wooden watch company. Now what’s cool about their company is that they managed to generate 1 million dollar in sales in their first year using only Instagram as their marketing channel. And as you all know, Instagram is a great way to market your ecommerce store if you know what you are doing. Clearly Ibrahim and Bishoi know what they are doing and today, we’re going to find out their strategies and tactics. How they manufacture their watches. How much he invested to get started. Why he picked Instagram and not another platform. Today I’m thrilled to have Bishoi Khella on the show, and what’s unique about Bishoi is that he used Instagram to turn his wooden watch company mytruwood.com into a seven figure business in under a year, and today we’re going to talk about exactly how he did it. Now before we begin I want to give a quick shout out to Seller Labs who is a sponsor of the show, and specifically I want to talk about their brand new tool Ignite which helps sellers manage their Amazon sponsored ads. Right now I’m using this tool to manage my Amazon sponsored ad campaigns, and it makes things a heck of a lot more convenient. So number one I’ve always found it a major pain to generate my PPC reports on Amazon, cut and paste the data over to an excel spreadsheet and use pivot tables before I’m able do any analysis. Now Ignite pulls all that info for you automatically and allows you to easily see what keywords are working and what are not immediately, so there is no need to manually create reports or play with excel. So let’s say one of my hankie keywords is bleeding money, well Ignite will alert me of that fact, and I can reduce the bid immediately. So bottom line Ignite makes managing your Amazon sponsored ads much, much easier and the fact that they provide me with alerts means that I no longer have to monitor my campaigns like a hawk. If there are keywords that are doing well, Ignite tells me to add them to my exact match campaigns, if my keywords are losing money, well Ignite tells me to either remove the keyword or to reduce the bid. So head on over to sellerlabs.com/steve where you’ll find some awesome tutorials on PPC and the opportunity to try Ignite for 30 days for free. Once again that’s sellerlabs.com/steve. I also want to give a shout out to Klaviyo who is also a sponsor of the show. Now I’m always super excited to talk about Klaviyo because they are the email marketing platform that I personally use for my ecommerce store, and I depend on Klaviyo for over 20% of my revenues. Now you’re probably wondering why Klaviyo and not another provider. Well Klaviyo is the only email platform out there that is specifically built for ecommerce stores, and here’s why it’s so powerful. Klaviyo can track every single customer who has shopped in your store and exactly what they bought. So let’s say I want to send an email to everyone who purchased a red handkerchief in the last week, well that’s easy. Let’s say I want to set up a special autoresponder sequence to my customers depending on what they purchased, piece of cake, and there is full revenue tracking on every single email. Now Klaviyo is the most powerful email platform that I’ve ever used and you can try them for free at mywifequitherjob.com/K-L-A-V-I-Y-O, once again that’s mywifequitherjob.com/K-L-A-V-I-Y-O. And if you’re interested in starting your own ecommerce store go to mywifequitherjob.com and sign up for my free six day mini course. Just head on over to the front page, enter your email and I’ll send you the mini course right away via email. Now on the show. Steve: Welcome to the My Wife Quit her Job podcast; today I’m happy to have Bishoi Khella on the show. Now normally I actually don’t interview anyone on the show that I haven’t actually met personally, but they put together a great pitch that just happened to coincide with material that I was looking for. Now it’s a two person company, Ibrahim and Bishoi, they started mytruwood.com which is a company that sells affordable and stylish wooden watches. Now what’s cool about their company is that they managed to generate almost a million dollars in sales in their first year using only Instagram as their primary marketing channel. 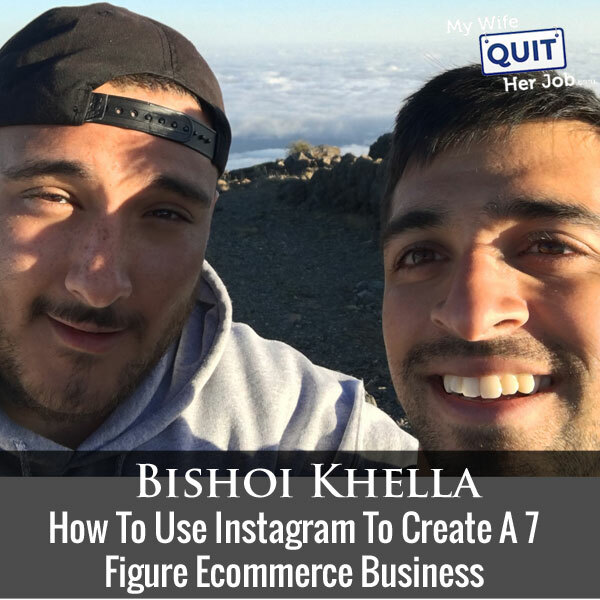 As you all know Instagram is a great way to market your ecommerce store if you know what you’re doing, and clearly Ibrahim and Bishoi know what they’re doing and today we’re going to find out their strategies and their tactics and kind of break it down for you. And with that welcome to the show Bishoi, how are you doing today man? Bishoi: Great Steve, thanks for having me man, appreciated. Steve: Yeah so Bishoi why wooden watches and how did you get into the ecommerce? Bishoi: So me and my partner Ibrahim we started our company in our last semester in university, and we just saw tried and we just thought we should try something, we might as well try it in our last semester and if it doesn’t work out we just end up going on jobs that we had lined up. So we started it and it ended up taking off and we didn’t take our full time offers and we just continued working on this ever since. So the reason why we started wooden watches is because we’ve been looking at products to sell, we’ve always had like some entrepreneurial mindset, we’ve always been looking at products that we could sell and try to make some money off of it, but it transitioned into so much more than that like we’re so deeply rooted in this company and our mission and we just ended up coming across a few watches and a few sunglasses that were made out of wood. We were like wow, these are beautiful and we wanted to buy them ourselves but as students we have a debt and we have student loans and stuff like that, and so we couldn’t justify paying like $300 to $400 for a nice wooden watch. So we were like, hey let’s try to make it ourselves, maybe make one or two for ourselves and see how it goes, and then we were able to get our costs pretty low. So we were like, hey let’s actually start this as a business because we were trying to do ecommerce anyway, so then it transitioned into something like that. Steve: Where did you find these wooden watches? Bishoi: We saw another company and then we were taken back, we were like, wow this is so beautiful but we click on the link and we see that like it’s like literally 300 bucks and we were like we can’t afford a watch that much, we were trying to search for the company with like something that’s more affordable for the masses and more of like an everyday watch, and that’s why we set out to create Truwood. Steve: Okay and did you have like a process of researching your niche, or is this just something that you came across because you wanted one of these and so you decide to sell them? Bishoi: Well it started like that, it started because we wanted it and we kind of assumed that a lot of people were in the same boat as well as that it’s such a unique product, not many people have even seen one before, and so you kind of want it, but at the same time you can’t justify spending X amount of dollars on such a new product that you don’t even really know about, like you don’t know how it’s going to look or something like that, because it’s so new, you don’t see this often. So we wanted to set out to create something that’s affordable for everyone, and we kind of take our vibe of our company a lot differently than our competitors, so they more market it like a premium luxury product while we try to be like that friendly show company. We put smiley faces on our emails, we connect with our customers like that, and we try to stay away from like the professional – that type of company. Steve: Okay, I guess what I was trying to get out was like was it like a quantitative analysis like did you judge the market size or were you just really interested in the product and you kind of knew that there was demand for it? Bishoi: Well we definitely, it’s a mixture of both. So we did know that the product had demand based on our competitors and at that time we saw that they were getting some fairly good traction, people were like, wow I’ve never seen something like that. So in terms of that, but then we did a ton of research like to figure out who we can market this to and how we can get it out at different angle then what’s currently out there in the market, because we believe that to be able to come in and compete in an industry you have to either be significantly different, your product has to be significantly different, or you can market it to a different type of niche or a different type of person than what’s currently out there in the market. We couldn’t find anything that was for the low end – not really, I wouldn’t say our products are necessarily cheap, cheap in terms of cost but they’re definitely one of the cheaper options out there, and we didn’t want to sacrifice on quality either. So we set out to make a really good watch for an affordable price and maybe take a hit on the margins, but at the end of the day it helps us with planting more trees in the end because more people are going to be drawn to it. Steve: Yeah let’s talk about that a little bit because you’re positioned kind of uniquely, so first of all you are not going for the high end, right? Bishoi: No right now we focus on the low end market, not even low end just the average medium size and medium consumer, but we’re definitely transitioning into having some higher end models just so we can capture a wide range of the market, but right now we’re primarily focused on the affordability of our product. Steve: And then you also plant, is it ten trees I can’t remember for every sale? Bishoi: Yeah it’s ten trees for every order definitely. Steve: Can you talk about like how that has affected your sales or do you have any correlation? Bishoi: Yeah definitely, so planting the trees was something we were very adamant about and we want to do that for sure because our products are made of wood, and so we’re taking away from the environment in that aspect, but we wanted to give back like ten times more than we were taking or hundreds of times more than what we were taking. So like one watch can probably – one tree can probably make thousands of watches, and so we plant ten trees for every watch or every order, and so we give back thousands of times in return just because we don’t want to be taking from the environment. Our whole goal here was to create a sustainable business and also it does resonate well with our customers, but our focus here was our product first and then having a social aspect associated with the business is definitely a bonus, and is something that people can get behind easier. But I’d say that the primary focus for us was creating a great product and then having a social aspect actually just adds to the benefit of the whole purchasing process. Steve: How have you leverage that social process, like do you have like a fan page that kind of emphasizes trees and protecting them? Bishoi: No we actually don’t have like a specific separate page for that, we try to push the story through our website and through our Instagram page, and through any marketing channel we do we always push the fact that we plant ten trees. But our focus here is that we want our customers to love the product itself and fall in love with the actual product, and then the mission behind our company just adds value to the whole experience rather than being a company that, hey we plant trees but we also give you a wooden watch. So our focus was more we sell watches but we also plant ten trees at the same time, rather than it being a focus on the trees and then you also get a watch, because anyone can go out there and plant ten trees for much cheaper than they would for buying a watch, and so our primary focus has to be on the products. Steve: No of course yeah and it’s actually for the people who are listening out there, it’s always great to have some sort of story behind your product and the fact that you plant trees kind of lends a nice back story for your company. Bishoi: Yeah definitely, we think so too. Steve: So where do you get your watches manufactured, is it in the US, Asia? Bishoi: Yeah our watches are made in Asia right now. Steve: Okay and how did you find your vendors, because you mentioned before there is not a lot of people doing this right now? Bishoi: Yeah so we started on Alibaba, I’m sure a lot of people who are in the ecommerce world would know about this. So Alibaba is a great company that connects suppliers with people who are looking to supply something or is looking to manufacture something. So we just started searching and we did endless searches on Alibaba for someone who would make a wooden watch for us, and we started hitting up not even wooden watch manufacturers but regular watch manufacturers. Some people would say they couldn’t do it, so we did do quite a bit of search to find a good one and we went through a ton of prototypes with a ton of different manufacturing companies until we found the one company that we were really happy to be working with, and we’re confident in the quality of the products that they make for us. Steve: So when it comes to designing a wooden watch, none of you guys have a design background, do you? Steve: Okay, so how do you convey – I imagine you have to have a factory that works with wood, right? Bishoi: Yeah definitely of course. Steve: Okay and then did they already have things that they had already made for other customers at the time, or were you putting out literally a new product from a new manufacturer? Bishoi: No it was – they have made wooden watches before, so it was easy in that sense that we don’t have to create like a whole new machine or some process that would be able to make the wooden watch, so they already had the process in place, we just had to design the watches. The great thing about our current manufacturer and the ones we worked with, a lot of these guys actually help you with making the designs so they have their own engineering team, their own design team and you could really put your ideas in words and send them kind of like pictures of other watches and be like I like this part of it but I don’t like that, or I want to add this to it and put it all in words and even try to send them drawings or maybe kind of a mark up on the computer and they’re able to draw it out. Then once you sign off on the design they end up sending you cut drawings and then you approve those cut drawings and you’re good to go. Steve: Okay so it’s not like you put together the cut drawings, you found watch styles that you like, picked and matched different pictures that you liked and then had them create the mark ups for you? Bishoi: Yeah definitely and also in words too like just explaining, so we like this color, and they also have a ton of like what do you call it, just designs of exactly what they have, so like they have maybe a booklet of 5,000 arms like hands for the watch, they have a booklet of 5,000 crowns of the watches they have and then we kind of put together, we went through everything and put together in that sense and also based on other designs we’ve seen in the past. Steve: In order for them to do work for you, did you have to purchase a lot for your first purchase? Bishoi: You usually negotiate the terms prior to you ordering a sample just because let’s say you order samples then they just tell you that it’s 500 bucks for a watch and then that’s not the price point you wanted to be at. So we negotiated the terms prior to ordering samples and then once everything is good to go in terms of how low you wanted the cost to be we’d get the samples, but we’ve never had to actually pay out any money for the mass order until we approved the samples. So you can imagine the samples are pretty expensive compared to the bulk order because they don’t know if they have you in lock yet, you know what I mean? Steve: Sure, how much did you pay for the samples and how many units was your first order? Bishoi: It depends on what sample we got, I’d say anywhere from 80 to 150 bucks per watch, yeah it’s somewhere around there, and our first order I think was for maybe 300 watches, something like that. Steve: Oh okay, so not that high, and then meanwhile they were putting together custom watches for you? Bishoi: Yeah completely custom, they are completely our designs yeah. Steve: So let me ask you this, how did you convey to them that you were like a serious player, because I would imagine they get requests like these and it requires significant resources on their part? Bishoi: Yeah definitely so a lot of these companies they do have minimum order quantities. We got lucky in the one that he kind of is always behind us and he actually believes in our ability to take this where we needed to take it, and so he actually made an exception for us in being able to get the minimum order quantity down to 300 units. Then ever since then our orders have been way larger than that like we just ordered probably over 10,000 watches back in November. Steve: And when you had to make those orders like do you have to focus on one style or could you mix and match different styles? Bishoi: Yeah so that’s the thing too is they don’t like to – I can’t tell them I want five watches of 50 different styles, so that’s another thing like we had to really negotiate and tell them, hey don’t worry, just trust us, we’re not looking for just a onetime manufacturer, we want someone that we can partner with and we can build our company with them. So we were able to sell them on us and then they were able to just let us do lower minimum order quantities on different styles. Steve: So that first 300 order, was that a single style then? Bishoi: No that was six styles actually. Steve: Oh six styles, okay so then you ordered 50 of each? Bishoi: Yeah that was the lowest, I don’t think you can even – I’m pretty sure that’s unheard of in terms of getting something manufactured, but we did pay a premium for that. Obviously they wouldn’t have done it if they were losing money on it and we did definitely pay a premium compared to what we’re paying right now for our watches. Steve: Can we talk about the margins for that first order? Bishoi: They were pretty low; I think it was, gross was probably 50%. Steve: Really okay and then what are they now on the bulk mark? Bishoi: They are 70 gross. Steve: Okay and you had to order like 10,000 in order to get that, get those margins? Steve: Okay and how long did it take you to get your first product to market then? Bishoi: So what we did was we ordered a ton of samples from different manufacturers and so we got the first – we thought we were going to do it in like a tiered system where we try one manufacturer then see the samples, if we like them we’d go with them, if not we’d go on to the next one. But what we found was that was taking way too long before we could get to market because now we have — the lead time for our watches are two months, so every time we have to wait and start a new guy, that’s a two month waiting period. Steve: What’s the turn, are we talking about like 10, 20? Bishoi: Oh year around like eight let’s say. Bishoi: Until we found the one that we are really happy with. The first one we got for example, it was a wooden watch and so it is made out of wood and you touch it and it would give you like splinters and we were like, okay this manufacturer is a right off, yeah that was crazy and we were actually set out to make the thinnest wooden watch in the market. We tried to do that at least and so that was our goal, and the first manufacturer gives us this like bulky watch that we would not – like it was completely opposite of our vision for the company, and so we had to really like just be like, hey we’re not going to worry about how much we spend on prototypes because at the end of the day once we get it working that money will be insignificant compared to the upside of having a great product. So we just ended up going all at the same time trying to hit up a ton of manufacturers all at the same time and not worry about, hey let’s not spend an extra couple of a hundred bucks on another manufacturer. Steve: How much did you invest to get started including that first turn to get an order? Bishoi: The big part of our success actually was in Canada where we are based out off, there is a grant with the Ontario government, it’s called the starter company program, and what they do is they offer grant money, free money for startups for young entrepreneurs. Bishoi: And if they like your idea they give you the grant money, and that really helped us because we were students, we at this point were students and we had a ton of student debt to pay off and rent and food and were not living at home. So we did need the money to start it off with the grant and that really helped us a lot. Steve: How much was the grant? Steve: Okay, nice, okay so you started for five grand, awesome. So you mentioned that your main sales channel was Instagram, so first of all why did you choose Instagram and not another platform in the beginning? Bishoi: So Instagram is great just because you could see the picture, you have full occupation of the person’s screen and so for that split second as they are scrolling you kind of have their full undivided attention on that one area, and so that was a big reason. We also have a couple of friends that have also been in the ecommerce businesses and they’ve seen success through Instagram, so it was kind of an easier lead for us to try it out and that’s why we chose Instagram over the other ones. Also in terms of competition, Facebook is probably one of the bigger advertising platforms out there and there’s just – if you’re trying to compete in the US and Canadian markets there’s so many companies competing for that same space, and so starting out we don’t really have too much money in order to test a lot of stuff which is the type of strategy you have to play with Facebook. You have to do a lot of testing in order to hit the cost per click that you’re looking for. So we decided to go with Instagram just because it was a good way to start because we didn’t have too much money to invest in testing on it, yeah. Steve: Okay and just to be clear this is like organic Instagram traffic, right? Bishoi: Yeah exactly, I’m not talking about paid through Facebook yeah. Steve: So let’s say you have this Instagram account with zero followers, can you walk me through how you started it up? Bishoi: Yeah so we have an Instagram page with zero followers and we just started hitting up company — large pages that have a good following in our niche and we just started to hit them up and we tell them, hey do you mind posting a picture of our watch for us for X amount of dollars? We just kept growing our roster that way. Steve: How many pictures did you have in your account before you started reaching out? Bishoi: Probably ten, we tried to fill up the page, so like if you are on our main Instagram page like right at the home page of our page, you’d see like the full page of pictures. Steve: So when you were hitting these Instagramers up, what follower accounts were you looking for, how much does it cost to have them post a picture of yours? Bishoi: It varies significantly depending on the size of the account and how engaged their follower base is. So we started off with literally the smaller accounts because we couldn’t afford to pay a million follower accounts. Steve: So how big is a small account in your ads? Steve: And when you’re measuring engagement what are you looking for? Bishoi: We are looking at comments, we’re looking at likes and we’re looking at as a percentage of their follower base, and if the comments are real or fake we’d also look at that because a lot of these influencers are part of groups and the groups try to help each other by commenting on the other person’s photo. So that ends up improving the score of the photo and so for us we counted that as fake even though they are real people, they are real followers but we try to go for those real, real accounts at the beginning just so we could have a good return on our money in order to reinvest it. Steve: What’s a good percentage? Bishoi: In terms of engagement? Steve: Yeah comments versus followers. Bishoi: We try to go for anything over 2% depending on the actual account. So if the account has a million followers you’re typically going to get a lower engagement in terms of percentages because it’s harder to engage a higher percentage of a million people. Steve: Do likes matter for you or is it just comments? Bishoi: Likes definitely matter, like if we have a 50K page with 300 likes that’s kind of a red flag to us that, hey this guy is probably not, he doesn’t have real followers. Steve: What were the percentages of likes look like, like you mentioned 2% for comments, what about for likes? Bishoi: No I was talking about 2% in total for engagement. Steve: Oh engagement, okay comments and likes. Steve: Okay got it, so that 50K person like how much would you pay, let’s say they followed your criteria? Bishoi: Anywhere from 50 bucks – no actually I’d say anywhere from 30 to 50 bucks for a 50K account. Steve: Okay so that very first Instagram account that you hit up and they posted a picture, did you get any sales from it? Bishoi: Yeah we actually did, we got a few sales and we were super stoked and then we ended up continuing with them for a couple more weeks and so we kind of outgrew that size and then continued to the higher follower accounts, and we kept kind of trying to scale up that way in terms of being able to afford more larger accounts yeah. Steve: So it was profitable immediately? Bishoi: In terms of marketing side yeah definitely, right away we were able to generate a return. Steve: Okay, that’s basically one sale right if you’re paying 30 to 50 bucks. Bishoi: Yeah definitely that’s like one or two sales and we’re good to go. Steve: Okay and then in terms of finding these people like do you have a specific strategy for it? Bishoi: Nothing really specific, our strategy has been just to find accounts that are niche and then vet them based on how good the account is. Steve: Is it just based on hashtags or like how do you find these accounts? Bishoi: We just search it on Instagram really; we just search whatever like whatever we were trying to target. So if we’re trying to target something that’s for couples, we try to search for couple pages and stuff like that, just hashtags or even in the search bar you just type like anything and it even shows people right away, so yeah. Bishoi: Like an actual account? Steve: Yeah or just something, you don’t have to give the actual name but like give me an idea of an account that actually buys watches that you’ve used. Bishoi: Oh in terms of a niche, right is how you’re talking? Bishoi: Oh yeah definitely, we do a lot of advertising on nature pages because our whole premise is we plant ten trees and so that also engages with those followers highly as well. Steve: Interesting so those nature followers they are not necessarily looking to buy watches, right? Bishoi: No, definitely not. They might be and a lot of the times they do want to buy watches too because like the watches are pretty unique and a lot of people like to give them as gifts, so it does help in that sense. Steve: Okay and so can you just kind of run down like your top three, say nature pages, what else? Bishoi: Nature pages, probably – I’m trying to think which one would be a second, I’d say probably like animal pages. Bishoi: Yeah, so like our goal for us really was just so we could be able to handle large target for a one time with one single post, and so by hitting up any of these pages you’re likely to have someone that’s going to be able to buy your watch. So just having the size of the page being so large you’re definitely going to get a lot of people that are interested in your type of product. Steve: Okay how do you – animals, that sounds really random, was that just an experimental thing or did you start out going, hey I want to target animal pages? Bishoi: Yeah it definitely was, it definitely was experimental. Steve: Okay and in terms of approaching them, one, how do you find their contact info and how do you approach them and what do you write? Bishoi: We find their contact info on their page, a lot of these people who have a ton of followers they know that their account is good for advertisement and so they have their address on Instagram, or a lot of times you could just DM them, but a lot of times they don’t answer just because of the size of their account, they get a ton of people reaching out to them every day. Steve: Okay and so you try to – they probably leave an email address or something like that? Bishoi: Yeah a lot of the times they do, they leave an email address in their bio and you could just hit them up that way. Steve: And so what would you write to them as an initial contact? Bishoi: It’s really hey — actually let me try to pull it up if I can. Bishoi: It’s just basically introducing ourselves and introducing our company and we feel like our product would be great on their page and their followers would probably likely engage with our photo, and we also try to leverage other accounts that we use. So we like check out our post on so and so’s page and see our engagement compared to other ads that they run, and we were able to leverage it like that. Steve: Okay and in terms of talking prices do you ask them for that upfront? Bishoi: Yeah straight up we ask right away on probably one of the first messages, we’re like, hey do you mind sending us your pricing for your page and then they send it back and we try and negotiate if we don’t feel like it’s a fair price, but most of the times these guys are pretty aware of what they should be charging for their accounts, so you could end up paying anywhere from like 300, 400 and 500 dollars just for a shout out and I’m not even talking celebrity, I’m talking about like just regular pages. Steve: So what’s a good ROI for you in order to keep going with an influencer? Bishoi: For marketing we were aiming to have under 15% just because our margins are so low compared to other watch companies because that was our overall goal, so we really have to be cognizant of how much we’re paying for it. Steve: So we’re talking like a 6X return on ad spend then? Bishoi: Yeah around 6X yeah. Steve: Okay interesting and was that just a number that – like how did you come up with that number? Bishoi: So we kind of had like a goal for net profit because we don’t even pay ourselves really much right now, and so without having a goal for net profit we kind of worked up that way. Steve: So let’s say you find someone who is like a 4X ROI, do you just stop working with them? Bishoi: No, no we don’t try to generate a return on every single account; we try to have it generated on overall return on our portfolio if you would say. Steve: Okay so that’s like kind of what I was asking then, so if you find someone – like what are your factors for continuing on with them and when do you just outright stop, like what’s the low threshold and the high threshold? Bishoi: So a lot of the times you could gauge the success of account not even by the sales but by the amount of visits you get right after you post, so let’s say I have a post with them at 3PM and then I’m constantly monitoring the traffic to our website and if we see some sort of a spike, then we know that the account is pretty real and pretty good because really their only job is to drive traffic, it’s our job to make the sale, and so we can’t really judge the quality of the account based on the amount of sales we get, we kind of try to judge it by the amount of traffic we get to a certain extent. If the traffic is from a country that isn’t likely to purchase, then obviously it’s not as valuable as the traffic from the US or traffic from Canada who are more likely to do purchases online, you know what I mean? Steve: Yeah, how long does the link stay in their bio? Bishoi: A lot of these guys don’t do links in bio; we try to push them to our Instagram page which is how we kind of grew our follower base pretty high as well. Just by pushing them through our page and so that gives us the opportunity to get a follow from them and be able to sell later on and provide content as well. A reason why our Instagram page if you look at it has such great engagement compared to others is because we decided that we’re not just going to be pushing products down our customers’ throats all day long, we’re going to be providing great content that they like to engage with and also push our products. We actually push the great content more than we push our products just because providing value has been key for our success. Steve: So let’s talk about that, let’s talk about the content that’s actually on your page, like what are some of the photos that you like to post? Steve: How do you get those photos? Bishoi: We actually get them off other pages and they’re kind of happy for us to use their photos because that ends up driving traffic to their pages, because we always put like photo credit so and so. So it ends up driving traffic to the person who posted the photo and it provides great content for our follower base, so it’s kind of a win-win. Steve: So there’s not a watch in that photo then? Bishoi: Sorry in the specific photo that we post? Steve: No I mean you mentioned like you have photos from all over the world, like do they contain watches or they are just nature photos? Steve: Got it, got it, but then you do have photos obviously with your product in, right? Bishoi: Yeah of course, so we try to do like a two to one ratio where for every photo of nature or engaging content that isn’t related to our product, we do one of our own product photos. Steve: When you say engaging content, are you talking about like your photo linking to a post or literally just the photo? Bishoi: I’m talking about literally just the photo, like content that people like and engage with in terms of – like so if I were to post a ton of product photos on all my page, our account would not be as valuable in terms of how greatly people are engaging with there just because people tend to engage with product shots rather less than they do with like nature, nice looking pictures, you know what I mean? Steve: Can you talk about like your highest performing Instagram post and what you wrote in the comment section? Bishoi: Yeah so probably our highest performing photo has definitely been a nature photo, I’m trying to think which one but I don’t have one right off the top of my head, but usually it’s related to the photo and just like whatever comment we could come up with that’s related to the actual picture. Steve: Okay so it’s much more about the photo and very little about the comment, like you don’t spend that much time on the comment? Bishoi: Oh yeah no definitely finding great photos has been our key – definitely been the key for us. Steve: Okay and so just by paying influencers your account just gradually builds up, so what percentage would you say – okay and you’re guiding people to your account, so they actually have to click twice just to make it to your site, right? Bishoi: Yeah so usually the thing with Instagram is that they don’t let you put links in the actual comment of a photo but they let you put it in your bio on your page, so they‘re going to have to click twice anyways because if they want to get to the influencer’s bio they’d have to click on the influencer’s profile. So our idea was like we might as well push them through our page, maybe a get a follow out of it and then also drive traffic to our Instagram page as well as the website. So either way they’re going to be clicking twice and so we’d rather have them click twice through our page rather than through somewhere else. Steve: So would you say then that almost all your sales are mobile sales? Bishoi: A lot of them are, a good percentage of them. I think what happens is though and I think that’s true for a lot of ecommerce businesses is the initial view is on mobile and then they come back later on desktop and make the purchase. So there is still kind of a healthy split but I think the initial like viewing of our company is on mobile. Steve: Okay so you’re paying influencers and you’re putting together good content on your page, what are other factors that you’ve used to build up your account? Bishoi: Those are definitely the two main things, great content and if you know shout outs through bigger pages that gives you more publicity to your page. I think those are the two main things and I don’t think that there may be anything else really other than those two big factors. Steve: Okay because I noticed on your account that you don’t follow anyone either, so you don’t like follow random companies with hopes that they will follow you back? Bishoi: No we tried out too, I mean you see a lot of companies doing that, we just try to follow like the one account we follow is our partner in helping us plant these trees and that’s really what we do right now. Steve: Okay so let’s go back and talk about finding the advertiser spot, like how did you come across the animals one which sounds really random to me? Steve: Interesting, how did you get on that list because we hardly get hit up for anything on Instagram? Bishoi: Really, we actually didn’t sign up for any list, we didn’t do anything; it’s just like actual individual accounts that are trying to generate money I guess. I guess how we get noticed is by running shout outs on other pages and then these smaller pages are people who are reaching out to us see our ad on another page and then they are like, oh he must be running ads, let me try to email him, you know what I mean? Steve: I see, let me ask you this, is there a special way that you search for specific instagrammers that are selling advertising? Bishoi: There are platforms out there, we haven’t used them ourselves, but I know there is a platform called Shoutcart and there is a ton of other platforms similar to that, [inaudible 00:38:33] I think is another one. So these are influencers who want to have a platform to sell their advertising space on and that’s completely like regulated too, so you pay the company and the company pays the influencer. Those are the people that actually are actively try to seek out business through publishing their page on a website. Steve: But in your case you are just doing it organically essentially, right? Bishoi: We’re doing it ourselves just because we like to develop a long term relationship with all our influencers like we have chats with them, it’s not like a strictly business relationship just because that also allows us to get good rates on the pages and it allows us to have like if we wanted to post one another company had a post we’d get precedence. So it’s definitely value in developing that personal relationship with each and every one of these accounts that you work with because the backbone of your business is kind of based on them being there for you especially it’s like if that’s your main focus starting out. So we try to do it ourselves, also you’d be negotiating better rates just because if you have a third party middle man they are definitely going to be wanting to take a cut as well, and so you just by cutting them you make some extra money or save some extra money. Steve: Okay and so when you’re reaching out to these influencers then, so you actually hop on Skype and you negotiate with these guys? Bishoi: No we talk to them just through chat. Bishoi: Just through chat yeah. Steve: And in terms of analytics you kind of work out when they’re going to post it and then you just look at your analytics for that specific time to see what happens? Bishoi: Yeah exactly and another thing we do is coupon codes specific to the page just so we can see how well they carry us, but we found out that around 50% of customers don’t even use the coupon code, so we just scale it up that way just so we can get kind of an accurate estimate of how many sales they get, so like if someone got one coupon, they likely have got two sales actually. Steve: I see so coupon codes is primarily how you track each source? Steve: Okay and like – because I would imagine you have multiple campaigns going on in any given day, right? Bishoi: Yeah definitely, we probably run a few, definitely a few ads every day. Steve: So let’s say something works with an influencer, like how soon do you schedule out another one? Bishoi: That was a big thing starting out, when we first started we didn’t have a big roster of accounts, so we kind of had to run them every day or every other day, and a lot of the times these pages don’t even like to do that and they flat out reject that offer just because if they’re pushing the same product every day it reduces the quality of their account and they lose a ton of followers every time they post an ad. So the tradeoff has to be there in terms of how much you’re willing to pay them versus how low their followers are going to go based on the ad. Steve: So what would you say is like the average frequency that you do in between campaigns for a given influencer? Bishoi: Right now we do three, four, anywhere from three to five days actually. Bishoi: Yeah we try to give a healthy space just because also you got to keep in mind that these followers have already seen the post like a couple of days ago and pushing them every day, we try to — by spacing it out by like three or five days you end up getting new people to the page as well because these pages grow a lot faster than your typical page, so any of these pages could grow by, within five days it could grow by thousands of followers. So you end up showing it to more new people that way as well. Steve: And in terms of – I’m trying to think, in terms of finding the average like could you provide some guidelines on like how you do it, not necessarily like what you see in the average but in terms of just doing the research on what pages could be potentially beneficial to your company. Bishoi: Yeah so it’s tough to say like exactly what I was trying to explain earlier is that we run an ad on a dog page or like an animal page and we’ve seen success from that, so it’s tough to say which is going to get you the success. But I’d say that when you’re first starting out take two things that you think are in your target market and in your niche and then when you have little extra money to try new things out on, try pages that have great engagement that might not even be related to what you’re selling. Steve: What is your hit rate then? Steve: In terms of like paying for an Instagram ad and getting a positive ROI, like what portion of your budget is for experimentation versus ones that you actually know generate cash? Bishoi: At this point we’re not really experimenting in terms of like just trying out accounts that we might already know we’re not really sure of, right now we have a pretty good roster of great accounts that we work with, and so we only take on board new great accounts like our hit rate is pretty good now just because we’ve had so much experience with other accounts over the last year, and so yeah we try to only bring people on board that are actually going to do well for us, so there is less experimentation now rather than when we first started. Steve: But how do you know someone is going to do well for you? Bishoi: It’s just how big their account is and how great their engagement is and how much they’re charging, because like I said these influencers are pretty attuned to how great their followers are or how great their engagement is, so for example I think it’s easier to explain with an example. So let’s say like a two million follower account reaches out to you and goes, hey would you like to buy promotions for us $25 a post. So that means right off the bat I wouldn’t even look at that account just because no two million follower account would be charging only $25 a post unless it was a fake account. So just by the amount of money that they’re charging for their account and they know the value of it, that also is a good significant determinant of how good the account is. Steve: I guess what I’m trying to ask is like do you get demographic information because I know like for our customers, there is actually a pocket of customers that are over the age of 55, like do you actually look at demographics and everything? Bishoi: So a lot of times when we hit off these influencers, now a lot of these influencer pages actually change their profiles to business profiles, and so they do have demographics on Instagram where you could ask them for screen shots of the age, the time their followers are mostly engaged. There is a lot of analytics on Instagram now and so that also does help in our decision making process. It tells you the age, the geographic location, and also the times that the posts do much better than others. Steve: Okay to kind of just sum up what you’ve been saying is you start out small with influencers that are very closely tied to your niche, I guess in your case would you target like people under watches or? Bishoi: We try to do watches and also nature because those are the two main aspects of our business specifically, and so it’s easier to find a nature page than it is to do a watch page for us, and so that’s kind of why we were hitting the nature pages hard. There is not many watch pages out there and if there are a lot of their engagement isn’t as great because you know most people would love to like a photo of a nature beautiful scenic area rather than like a watch sitting on a table, you know what I mean? Steve: Of course, of course, okay and in terms of rates can you just kind of give some general guidelines on how much things cost for so many followers? Bishoi: Yeah so anyone under I’d say 200,000 followers is going to charge you anywhere from $50 to $100. Once we get to the million follower mark you’re paying anywhere from $300 to $500 per post. Steve: Okay and then 2% guideline in terms of engagement which includes likes and comments? Bishoi: Yeah, I mean you’re going to get accounts that have way higher than that, but sometimes you’ll even get accounts with lower than that. That’s just based on the size of the account, so if the account has a lot more followers you got to be more lenient in terms of how high you need the engagement rate to be. So when we’re dealing with like million follower accounts we try to aim for anything over 1% is great. Steve: Okay and then have you ever tried anything larger than that? Bishoi: More than a million followers? Bishoi: When you’re talking about over like a couple of million you’re talking about celebrities and that’s a whole another ball game in terms of how much they charge. So a celebrity who has a couple of million followers would charge you probably a couple of thousand versus what a page with the same amount of followers would charge you. Steve: One thing I forgot to ask you was the creative that you have them share, is it a unique photo just for them? Bishoi: No, so we have a great photographer on board and we have a bunch of photos that we think are our best photos and so we send them out to all of them and there is not a unique photo that they’ve taken. A lot of influencers do that actually, they get you to – especially the photographer influencers, they’ll get you to send them a product and they take the photo themselves and they post it on their page and it’s a unique photo to their page and no one has ever seen before, a lot of them do that. I’d say the only negative aspect to that is you can’t really control how prominent the product is in the photo, so in the influencer’s best interest the product is hidden in the background, in your best interest the product is out in your face just so that people can actually see the product. So there is kind of a mismatch there, so that’s why we try to send them our photos just so we can control the quality of the photo. Steve: Okay and in terms of your photos then, are they photos that you have posted on your own account or are these unique photos? Bishoi: They are a mixture of both, so sometimes we get a brand new photo that we’re really hey this is nice, let’s wait before we post it on our page, let’s try it on ads and see. Steve: Okay but do you ever do a photo that’s already on your account? Bishoi: Yeah all the time. Steve: The highest performing one okay. Steve: Okay and do you just choose your highest performing picture than at that point? Bishoi: Yeah definitely it’s so much easier to choose a photo based on your profile just because you can go through your page and see how well it did on your page and if it did well on yours it’ll probably do well on others as well. Steve: Okay and Instagram ranks photos based on engagement, and so with the influencers – let’s see what am I getting at here, with the influencers is it really obvious that something that they post is going to get a lot of engagement based on prior engagement? Steve: You’re seeing what I’m getting at? Bishoi: I get exactly where you’re getting at, yeah that’s been a big switch for us, and that’s why we’re kind of trying to explore other marketing mediums just because Instagram now is becoming really tough to do well on versus probably a year back when we first started. So a big change that they did was posts are no longer chronological, they are based on the time, and so when I go, if you had posted first and then someone else had posted second, you’d see your post first then someone else second. Now the algorithm has changed in terms of what you see on Instagram, it’s based on how you engage with that person’s account. So if I start liking your photos much more often than I like John’s photos, then I’m going to be shown your stuff a lot more than John’s and I might not even see John’s, you know what I mean? Bishoi: So that’s been tough for us in terms of Instagram just because now obviously a promotional post on a shout out is not going to do anywhere near as well as what the page actually posts, so if it’s a nature account they post nature photos, you’re almost never going to get a good performing ad photo equivalent to a good performing nature photo. Bishoi: So that really hurts in terms of just the reach, just the audience because they don’t show the ad to as many people as they used to because it’s not chronological anymore and they also determine the score of the photo within like ten minutes in their algorithm. So it’s easy actually for Instagram to tell what an ad photo is versus a regular photo on the person’s page just by in the first ten minutes you see how high the engagement is going versus the other posts on my page, and then they could easily tell right off the bat that this photo is kind of a bad photo, let’s not publish it, let’s not show it to as many people. Steve: So how does that affect you going forward and like your advice for the people listening? Bishoi: It’s great to start off with Instagram just because you could get a wide reach and start growing your page and getting more social proof to your page, but right now our marketing spend has almost doubled within the last like couple of months just because of this new algorithm and that’s why we’re heavily focused on diversifying our marketing. Steve: Cool man. Hey Bishoi I really appreciate your thoughts on Instagram, if anyone is interested in your watches or wants to get a hold of you where can they find you? Bishoi: Yeah so we have a website, it’s called www.mytruwood.com, just shoot us an email and we’ll definitely hit you back up within like 24 hours at the very most. Steve: Yeah and just to be clear it’s spelt T-R-U. Bishoi: Oh yeah definitely thanks for that, it is a little weird doing the spelling just because we couldn’t get the domain, but yeah it’s good. Steve: Yeah I’ll link it up in the show notes but just in case like if you want to check it out and his account it would just obviously link to that, it’s very well done. Hey Bishoi thanks a lot for coming on the show man, I really appreciate it. Bishoi: Awesome man, thank you Steve. Bishoi: Take care as well. Steve: Hope you enjoyed that episode. Now Bishoi’s success with Instagram just goes to show you that there are a bunch of different ways to market an ecommerce business and you start to find out what’s working and then focus on it. For more information about this episode, go to mywifequitherjob.com/episode164. And once again I want to thank Klaviyo for sponsoring this episode. Klaviyo is my email marketing platform of choice for ecommerce merchants, and you can easily put together automated flows like an abandoned cart sequence, a post purchase sequence, a win back campaign, and basically all of these email sequences that will make you money on auto pilot. So head on over to mywifequitherjob.com/K-L-A-V-I-Y-O, once again that’s mywifequitherjob.com/ K-L-A-V-I-Y-O. So not only does it save time, but it also makes managing your Amazon campaigns so much easier too. So head on over to sellerlabs.com/steve and sign up for a free 30 day trial, once again that’s sellerlabs.com/steve. I sell homemade granola and cakes, and Instagram is my main channel to promote my products. I’ve only started listening a couple weeks ago to you, but I am already a fan! 1) Content sharing & Permissions : I see on Bishoi’s instagram , where he does give credit to the photographer, but is that enough? Or did Bishoi ask every photographer’s permission before he post? If this is needed, what is the best approach , especially when I am only starting out. 2) Switching to a business instagram account, is this a good idea? Also at what point should I consider switching over?